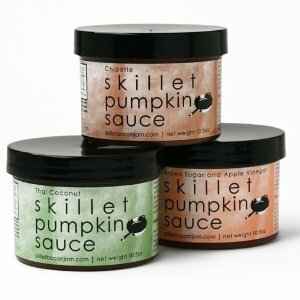 Skillet Pumpkin Sauce is the newest addition to the Skillet line. Our pumpkin ketchups have all the same condiment appeal as regular ketchup but with a unique ﬂavor and a great nutritional proﬁle that comes from the naturally occurring vitamins and minerals in pumpkin. Southwest meets pumpkin in our Chipotle ﬂavor! The deep smoky chipotle ﬂavor, coupled with aromatic spices, delivered on the rich base of pumpkin. Use it with home-made tortillas, or with traditional French fries. Add it to your super-secret taco recipe. Or marinate a ﬂank steak with it for the barbeque. Our Thai Coconut is ﬁlled with a rich coconut ﬂavor, Asian spices and curry, and – of course – pumpkin, the Thai Coconut ﬂavor goes in a new direction. It's teriﬁc as a dipping sauce with Vietnamese spring rolls or as a ﬂavor base for a stir fry with your favorite veggies. This sauce definitely took me by surprise! I sampled the Chipotle Skillet Pumpkin Sauce thinking it would be a totally weird but fun experience. My pairing of choice? Fried eggs! I fried up some amazing eggs leaving the yolks slightly runny then put a slap dab of this pumpkin sauce over them and a bit of salt and pepper. YUM! Have you ever tried ketchup on your eggs? My dad always put ketchup on his eggs ever since I can remember and as a kid I always thought it was gross. One day as a young adult I decided to give the ketchup on eggs a try and ended up loving it, wondering why I had chosen to miss out all these years. I figured if ketchup can rock some fried eggs then this Skillet Pumpkin Sauce really could rock my eggs socks off. I am so glad I tried it and can't wait to smother this stuff on other foods in the near future.